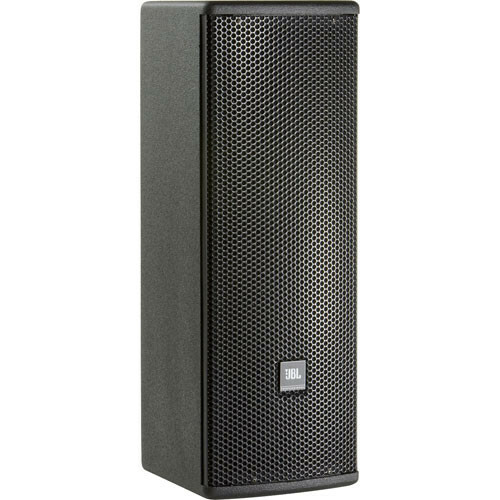 The AC28/26 B (Black) from JBL is a 2-Way loudspeaker with dual 8" LF drivers ideal for use in performing arts facilities, theatrical sound design, auditoriums, houses of worship, clubs, and themed entertainment venues. This speaker can handle up to 750W of program power and has a 1" HF driver with field rotatable 120 x 60° Coverage PT Waveguide. Dual Neutrik NL4 connectors plus screw terminals make it simple to add this speaker to your system. The AC28/26 B has attachment points for the optional U-bracket or OmniMount. 1" HF driver with field rotatable 120 x 60° Coverage PT Waveguide. Box Dimensions (LxWxH) 13.8 x 13.3 x 2.5"